Lucio Di Jasio is now Sales Manager in Europe for Microchip Inc. He was previously Application Segments Manager at Microchip in Chandler AZ. He has been intimately involved in the development of Microchip PIC products for over 10 years and is a well known writer and expert on the use of PIC products both via his Newnes books and his work at events such as the Microchip Masters. 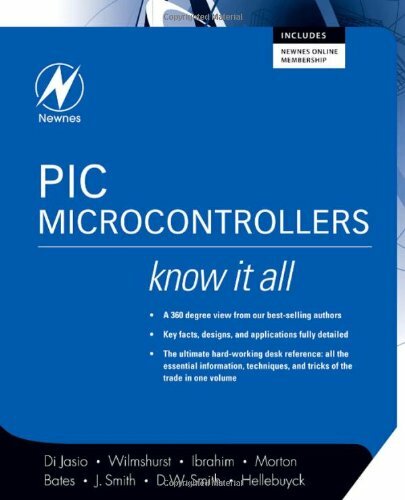 Tim Wilmshurst is the author of Designing Embedded Systems with PIC Microcontrollers. He has been designing embedded systems since the early days of microcontrollers. For many years this was for Cambridge University, where he led a development team building original systems for research applications - for example in measurement of bullet speed, wind tunnel control, simulated earthquakes, or seeking a cure to snoring. Now he is Head of Electronic Systems at the University of Derby, where he aims to share his love of engineering design with his students. Martin Bates is one of the leading authors specializing in introductory level texts on PIC microcontrollers for the academic, professional and hobby markets, with 20 years' experience of teaching microprocessor systems. Founder and president of elproducts, Inc., a firm specializing in devices and project kits based on the PIC microcontroller. He writes a monthly column on the PIC microcontroller for "Nuts and Volts" magazine. Prof Dogan Ibrahim graduated from the University of Salford with First Class Honours in Electronic Engineering. He then completed an MSc course in Automatic Control Engineering at the University of Manchester, and PhD in Digital Signal Processing at the City University in London. Prof Ibrahim worked at several companies before returning to the academic life. He is currently a lecturer at the Department of Computer Information Systems at the Near East University. Prof Ibrahim is a Fellow of the IET, and a Chartered Electrical Engineer. His interests are in the fields of microcontroller based automatic control, digital signal processing, and computer aided design.